The WLA has provided an invaluable intellectual home for me as I have worked to forge a professional identity over the course of my time in graduate school. Would you like a place to network with other WLA graduate students? The icon below links directly to our Facebook group, which will be visible only once you’ve logged in. If you are taken to a login screen, type in your user info and the URL will carry you straight to the group. Then hit “join.” The group is listed as “closed,” so your request will process only after an administrator has approved it. Membership is required to access message boards and wall posts. 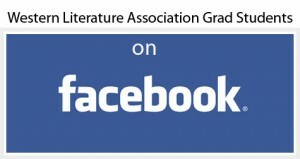 Join today and share your academic interests with other grad students, post academic inquiries, arrange conference room/ride sharing, and any other thing that you think would supplement your membership in WLA. Also, feel free to send a Facebook friend request to your Graduate Student Representatives, Rachel Bolten and Jes Lopez.